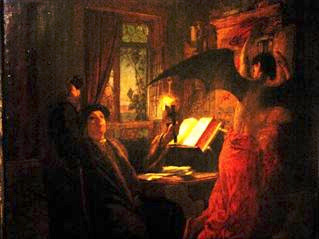 It's been said that Martin Luther while at Wartburg was translating the Bible; the Devil came to visit him. Satan, who was vehemently opposed to the divine mission of the great reformer sought to tempt him and thwart the work. In response, Luther grabbed the inkwell from which he was writing and threw it at the Evil One's head. For many years, tourists who visited the study of Martin Luther at Wartburg Castle were shown the ink stain on the wall that supposedly occurred when Luther threw the ink pot. Quite frankly, I too, was amused by the account when I first heard it many years ago and never took it literally – that is – until something similar happened to me. It was during a very challenging time in one of my previous pastorates. I was experiencing a sleepless night and restlessly pacing about the house while the family slept. I settled down in the recliner in our living room, when suddenly, I found myself in a zone that I can only explain as seemingly a place between sleep and being awake. Yet, I was wide awake and my senses heightened, but I could not move. My eyes spied a shadowy humanoid figure in the corner of the room. The entity exuded the purest form of hate and cursed me with a profanity so coarse and filthy that it was somewhat nauseating. Nothing told me so, but I knew that this was a devil – a demon. The demon said that he had followed me throughout my life and recounted a number of occasions when I nearly died and took credit for them. Most dreadful, when this devil spoke to me from across the room, I could feel it's breath on my ear. "I have failed again and again to destroy you, but I will kill you. I will get you yet," he said to me several times. Then there came a calming and gentle voice, which instructed: "Rebuke him in the name of the Lord Jesus Christ and he will leave you." So I did. Immediately the devil was gone and I could move again – no longer was I suspended in a trance-like state. I know that it's a fantastic story – an unbelievable one. Some will read this and likely use it against me, saying I am a fool of fools – a nut-job. Some will be more sophisticated and claim it was a nervous break-down of sorts. Nonetheless, I know that it was real – as real as any other experience in my life. I was in an unseen place where forces of light and darkness do battle – another dimension where powers work behind the scenes to affect life's events. That same night, deeply troubled by what I had seen, felt and heard, I begged God in prayer for an answer as to why in his providence he would allow me to go through such a terrible experience. "What does it all mean, Lord?" I fervently asked. "Why, Lord?" I said. "Why, in your purpose, did you order such a horror for me?" The answer would come as the day was dawning. This time there was no voice, neither a heavenly angel to deliver the message, just a sweet and peaceful impression I knew was the Spirit of God, telling me: "You are afraid of so much that you can see, but there are more fearful things around you which cannot be seen that mean you harm. Just as I kept that demon at bay in the corner of the room and would not allow him to touch you – just as I limited the power of that same devil who orchestrated by previous events to slay you – I am with you now as then and will not allow evil to put its hands on you – except as it may do you good, glorify my name, and advance my kingdom. Stop being afraid! Stop fearing the faces of men! None are nearly as bad as the unseen incarnate evil you witnessed tonight. Instead, trust me. Fear me alone, for I am sovereign in everything." That night was a watershed moment in my life and ministry. It was a turning point from anxiety and fear to faith. 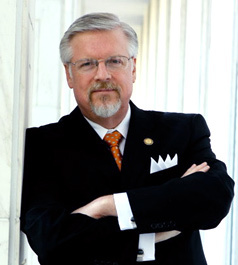 Since that time, in my pastoral role and my work as a Christian activist, when speaking the truth, I have faced some of the most disconcerting of moments – threats to my person – harassing phone calls – hate mail – powerful angry legislators wagging their fingers in my face – hecklers and chanters at speaking engagements – and the list goes on. But none have ever come close to being as awful as the wicked entity I faced that night a few years ago. Moreover, I understand as never before that God uses even the wrath of men to praise him and to accomplish his purposes. There shall always be attempts by Satan and his minions to frustrate the plan of God. Nevertheless, God's will can never ultimately be defeated. I am by no means a Martin Luther. Still, because of my own experience and the teaching of the Scriptures, I am inclined to believe Luther actually did throw the inkwell at the Devil.